At Second Street: Cake Help? This cute thing is having a birthday this weekend. I'm trying to decide what kind of cake to make her. We have a system in our family. We only celebrate birthdays with friend parties on our 3rd, 5th, 8th and 12th birthdays. In an effort in making birthdays special without all the craziness of a friend party I try and make a very special cake. Even though her birthday is days away, we haven't picked a theme for her cake yet. I usually leave it up to my kids decide what they want, but she doesn't know this year. She has a million ideas but no specific idea. Really she would like anything that is pink and girly. This was her cake last year. 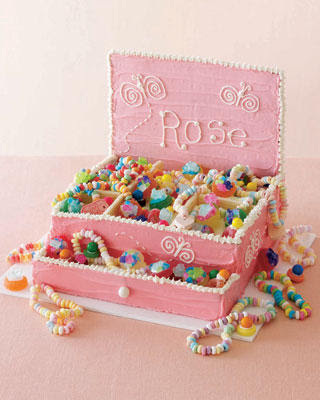 It's a candy cake. She LOVES Candy. Here is one idea I might try. I found it in a google search but couldn't find an owner. She is always carrying a purse around. This cake from Woman's Day is another possibility. Do you have any ideas? Have you seen anything cute and girly out there in blogland I should look at? Have you seen the kitkit bars surrounding a cake with M&Ms on top? I might try a mini version of this for hte BIL's birthday on Sat. I love this website. This is the one I'm trying for my daugher this weekend. I love the jewelry cake! Sounds like that would be perfect for her since she loves candy! The purse cake is adorable though too! Tough decision! One year a made my daughter's initial. I made a 9x13 cake, took it out of the pan, and cut it into a lower case "a". She loved it. WOW!!! Those are WONDERFUL cakes!!!! i like the idea of an initial. you can do a lot with that. Well, maybe if it's only a few days it might be too late to order, but there are some fancy molds by a company called Zanda Panda. There's a domed unicorn pan which could be made pretty girly and might be useful. 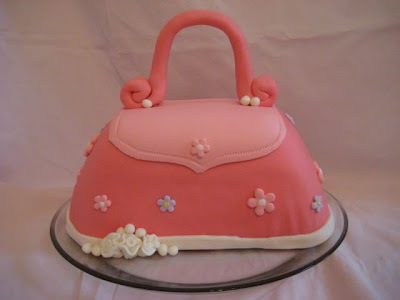 I LOVE that purse cake! I use www.cakecentral.com for inspiration. In fact I'm making a superhero cake for my nephews this weekend. I really like the fairy garden birthday, but there are tons of great ideas. Becca here from Blue Cricket Design! I am a huge fan and love everything you ever link up! I'm featuring you and your blog on June 5th on BCD! I hope you don't mind me gushing over you with a few of my favorite projects with links! Hope you enjoy it! Can't wait to see what the new cake will be ~ that cupcake was the best! Love the jewelry box. I would love to do a carousel for my daughter's b-day in June...I may have to stick to the giant cupcake though...I'm not that good.